It’s important to remember all of life’s lessons, especially the simple ones. Information like the following are used in our everyday life; “Don’t bite off more than you can chew,” “When life gives you lemons, make lemonade,” and the one I am still waiting to use, “Don’t take any wooden nickels.” And then there is “Keep It Simple Stupid” or “KISS” which is the grand principle behind New York City’s latest restaurant sensation, The Meatball Shop. Started by Daniel Holzman and Michael Chernow, this Lower East Side sensation has quickly become one of my favorite places to eat in the city. Guess what they serve? Meatballs. What else? Hand made ice cream sandwiches. You know what else? NOTHING!! That’s right, just meatballs. With a deep history in the restaurant and bar business, Daniel and Michael, decided to start the restaurant with one premise in mind, serve only meatballs but make them the best meatballs ever. The 2 of them went on a quest around NYC eating every renowned meatball in the city. 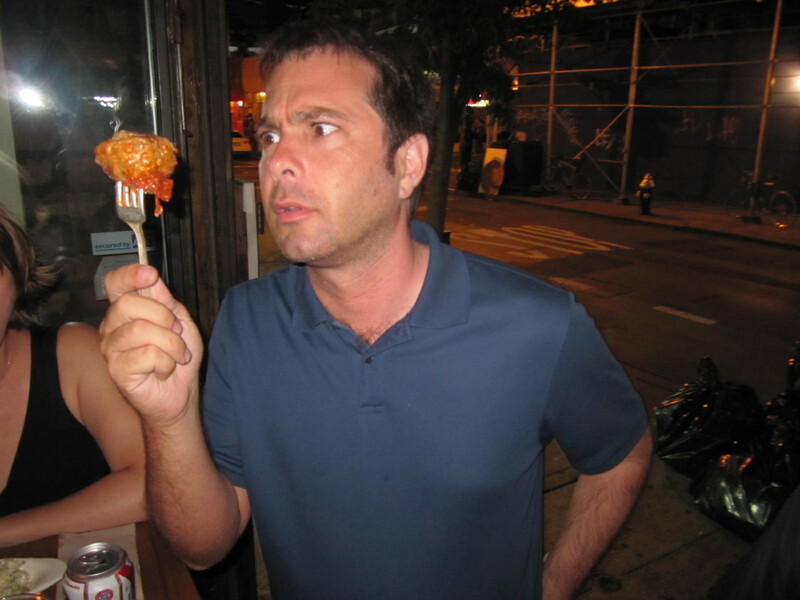 Michael’s pretty fond of telling the story and you may even get him to reveal some of the locations that influenced their meaty balls. 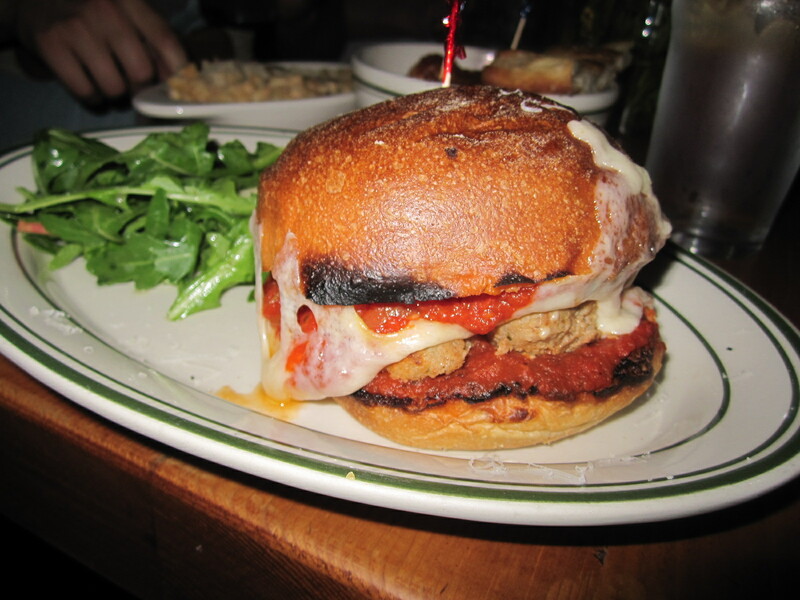 The menu is simple at the Meatball Shop. At any given time there are 5 meatballs available; classic beef, spicy pork, chicken, vegetable or the daily special. Likewise, there are always 5 sauces available; classic tomato, spicy meat sauce, mushroom gravy, parmesan cream and the daily special. 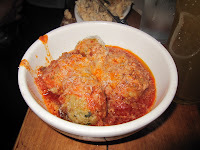 You can order your meatballs in a bowl, under pasta or beans, in a hero, as a slider or in a smash. Just grab a dry erase pen and mark off on the menu what you want. The waitress will be around shortly to take your menus and place your order. While you’re waiting, and sometimes the wait can be up to 2 hours, enjoy a glass of wine or beer from the small but great list available. Don’t feel like waiting? You can order the meatballs to go, just step to the counter in the back. Pick up orders can be made faster along with home / office deliveries via Seemlessweb.com. 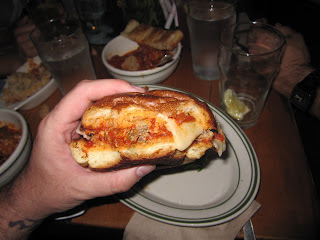 I’ve been to The Meatball Shop nearly a dozen times since their opening only a short 6 months ago. Their open from Noon until 4 AM, so whether its lunch, dinner or late night snack, their balls fit the bill. 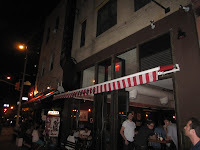 The Meatball Shop is great anytime but I find them most appealing later in the evening after you’ve had a few beers / wines / cocktails. They easily fulfill any late night munchies you can get. If you’re my friend on facebook you’ve seen many, many posts and pictures with their delicious meatballs. When our friends Karl, Julie and Tom came into NYC from LA for a visit, it was the first place they asked to be taken. “You’ve built it up enough and now it’s all I can think about” Tom told me as we made the plan. 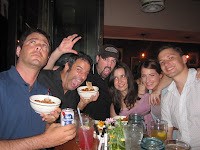 After a few beers at Idle Hands Bar, the bar some friends and I are about to open in the East Village, we made the short 7 minute walk to the Meatball shop with our tongues practically hanging out of our mouths. Going later at night is not only more fun but it’s also easier as the dinner crowd dies down and getting a seat is much easier. While I might argue, these balls are so good that no bread is needed, I remind myself that this is a burger site and I order a classic beef – classic tomato combo in a smash, which is essentially a burger; meat, cheese and brioche. God only knows how long they cook the sauce and meatballs but the flavor is like none other. The warm, hearty sauce with all of it’s Italian spices would satiate even the proudest of Italian families. It’s not too spicy, it’s not too bland, it’s not too garlicky (that might be an impossible feat) and it doesn’t take just like tomatoes. It’s just right! The meatballs are large, soft and melt in your mouth. Go slow!! Don’t miss a single second of their amazing flavor. Using the word “classic” to describe these meatballs is not only the perfect word, it’s also an understatement. Wedged between a fresh, toasted, slightly sweet and crunchy brioche with your choice of fresh mozzarella or provolone, you won’t find anything this good outside of your grandmother’s kitchen. 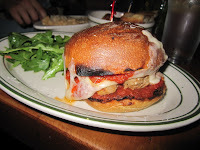 While I truly loved the smash and would highly recommend it to anyone curious, I have to say, with the Meatball Shop, no bun is needed. 9 times out of 10, I order the bowls in a ball with sauce. You’ll get a little piece of focaccia to dip up the left over sauce but these meatballs need nothing on top of, around or underneath. Do yourself a favor and order the spicy pork meatballs in the spicy meat sauce, it’s the most winning combo on the menu. Don’t let the name fool the weak of taste, they aren’t hot per se, just a little kicked up. It’s my standard and if I ever get to Norm from Cheers status (fingers crossed) at The Meatball Shop, they’ll just order me a bowl when I walk in through the door. If Michael and Daniel are smart, they’ll open a meatball rehab center around the corner! Good luck, they’re freakin’ addictive! 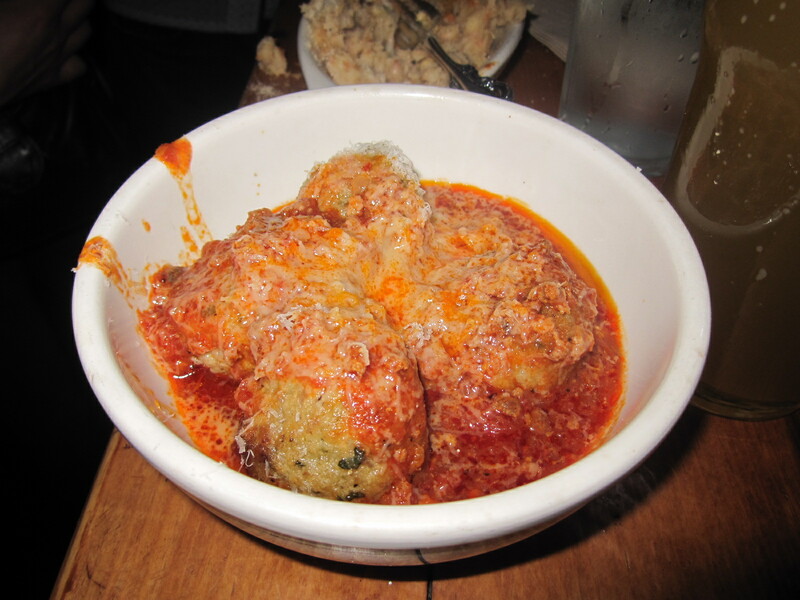 My love for The Meatball Shop has grown so intense that now when I go there to eat, I order some extra meatballs to be eaten as leftovers the next day. With just a couple minutes in the microwave, they heat up almost as good as they were served fresh. I’ve even started bringing them home to add into my home cooked meals!! 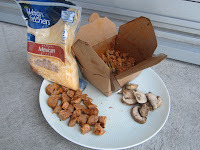 1 Cup sliced baby portabello mushrooms. No need for spices, there’s more than enough in the meatballs, sauce and sausage. Now I made these on the grill, because I am obsessed like that but you can do them on the stove top. 1. Fully cook Italian Sausages in skillet or on grill. Cut into bite size pieces and set aside. 2. Turn heat down on burner or grill and allow to cool down. 3. Spray some non-stick spray into your skillet and pre-heat on oven or grill at a low heat. 4. Carefully crack eggs into a large bowl. 5. Add in milk and beat until evenly distributed and yellow. 6. Pour mixture into skillet and allow to heat up for 2 minutes. 7. 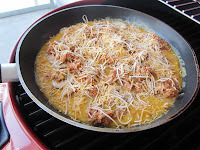 Mash meatballs in their sauce and then add into skillet along with other ingredients. 8. Stir every other minute. 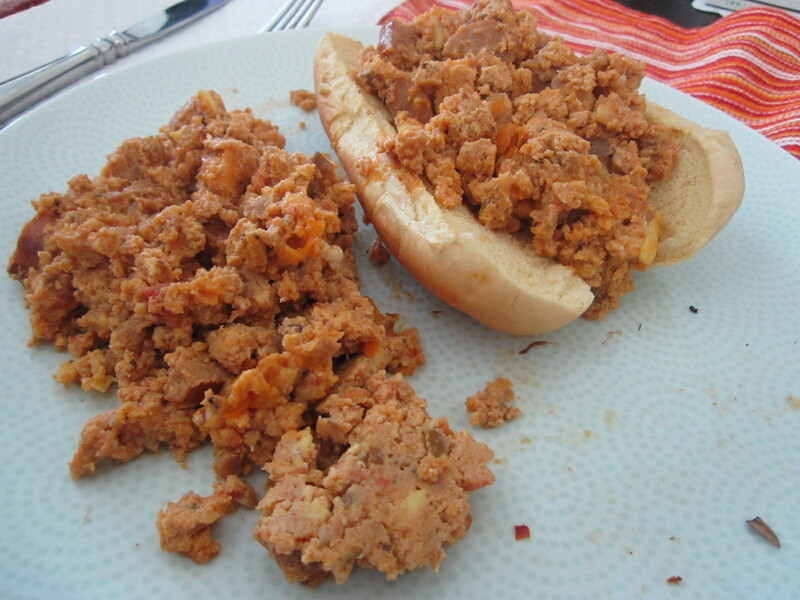 Eventually eggs will scramble and turn the mixture into something resembling a sloppy joe. 9. Cook until eggs are 90% formed. Remove mixture and allow 2 minutes to cool. 10. 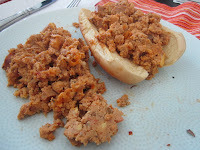 Scoop into potato hot dog rolls and enjoy. 11. Say goodbye to your hangover. 13. 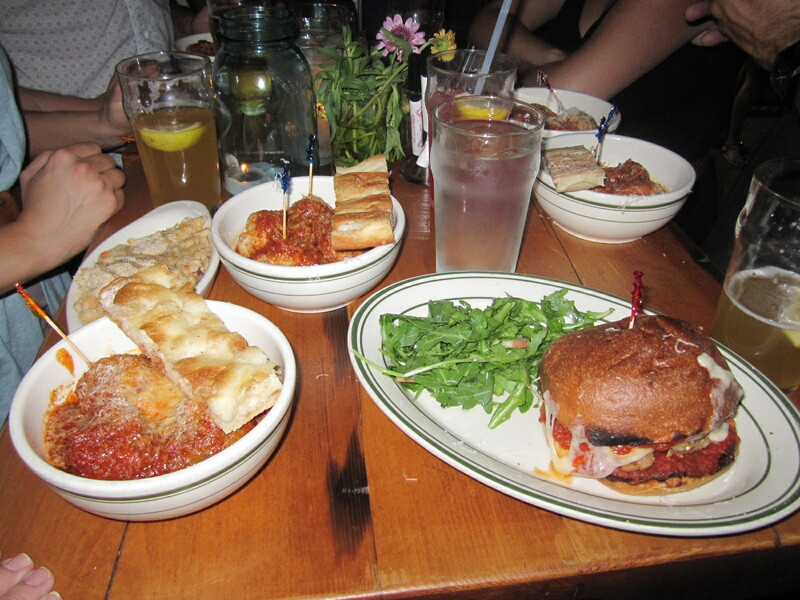 Go back the Meatball Shop and repeat entire process. This entry was posted in Uncategorized and tagged the great burger conquest hamburger cheese review new york nyc ny meatball shop meat ball smash meatballs. Bookmark the permalink. The meatballs are always delicious – even the next day when I reheat them at work! If they can survive an office microwave, you know they're good.